SAGITA COM - sagita-com.tk - ObjectDock Plus adalah software yang dirancang untuk memberikan kepuasan dengan gaya komputer Anda. Software ini memberikan efek, animasi dan toolbar melekat pada desktop dan Anda dapat mengubahnya sesuai dengan keinginan Anda. * Position dock on any monitor edge. * Create as many docks as you wish. * Create tabbed docks with new folder-tabs (Windows 7). * Get Aero-Peek like functionality for improved task switching. * Access your system tray icons via your dock. * Recolor your docks on the fly and more. * Adjustable transparency for background and icons. * Running indicators for open programs. * Minimize windows to dock with live minimize-animation. * Compatibility - made for older/slower computers. * Optional “auto-hide” when a maximized window is in use. 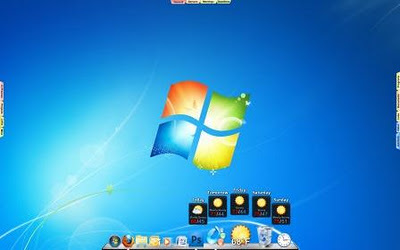 * New background blur-behind (Windows 7/ Vista only). * XP (32 bit)/ Vista/ 7 (32 and 64 bits). * 40 MB of free HDD space.